Oregon, with the postal abbreviation OR is one among the 50 states in the United States, situated in the Pacific Northwestern part of the country. Oregon is bordered by Idaho in the east, the Pacific Ocean in the west, Washington in the north, California in the south and Nevada in the southeast. The Snake River delineates much of the eastern boundary of the state, whereas the Columbia River delineates much of its northern boundary. The state of Oregon was occupied by several indigenous ethnic groups earlier than explorers, traders and migrants arrived. In 1843, an independent government was created in Oregon Country, and then in 1848, the Oregon Territory was formed. The Willamette River gorge in the western part of Oregon is the most thickly populated area of the state, and home to eight out of the ten most crowded cities in the country. Oregon is the 9th biggest and the 27th most thickly populated state among the 50 states of the country. 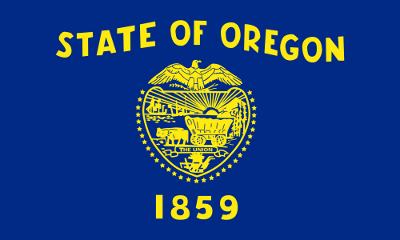 the state of Oregon was the 33rd state admitted to the union on the 14th of February 1859. The total land area of Oregon is 98,379 square miles, which offers the state an area rank of 9 out of the available 50 states in the United States. In addition, water surface occupies 2,394 square miles of the total area of the state within its boundaries. There are 36 counties in Oregon among which the Deschutes County was the most recent county formed in the state, in the year 1916. Consistent with 2010 United States Census information, the population of Oregon was 3,421,399. Among the counties of the Oregon State, the most populous county is the Multnomah County with the population of 735,334, and the Wheeler County is ranked as the least populous county with the population of 1,441. As of 2010, there are seven State Electoral Votes in Oregon. The State Quarter issue Date of Oregon is June 6, 2005. The state motto of Oregon is “She Flies with Her Own Wings“. Beaver State is the nickname of the state of Oregon. The name of the state bird of Oregon is the Western Meadowlark. Douglas fir is the state tree of Oregon, and the Oregon grape is the state flower. Salem City is the state capital of Oregon. The Portland City is the biggest of all cities in Oregon by population, and the same city ranks first in total land area, too. The Astoria City is the oldest city in Oregon. The Oregon State is served by three area codes, such as 503, 541 and 971.